I was on a Portable Content Symposium panel last night “Content with your content? How the convergence of media is changing everything we know”. A fellow panelist Ean Thorley (Exec prod at MTV Australia) briefly referred to a new MTV virtual space Laguna Beach – when we started talking about the impact web 3.0 on traditional media. It is a shame we didn’t get more time to explore this, significant development – a virtual space branded by but more importantly, containing the story world of the much loved TV programme. Launched in alpha on Weds last week it has been reported across the usual channels. Here is an excerpt of the MTV press release from news.com. Laguna Beach is a 3 year old show and has a loyal teenage following of those wanting a glimpse into youth beach culture on the US West Coast. It is partly reality TV and perhaps suitable for an MMO treatment, the scenes are often filmed from a great distance allowing the ‘mic’d’ characters to do their thing without a large crew around them. Wonder if the virtual version will have cameras rolling capturing the avatar interactions?! Having spent many weeks on and off in the real ‘art center’ Laguna Beach (in between LA and San Diego) I was interested to see where the program, the real environment and the virtual space met. I joined up a few days ago to their alpha/beta version (running on the ‘there.com‘ engine) to see what is happening and also compare a little to how this may have worked on a dedicated sim in second life. It is obviously a bit flaky at the moment – I kept getting logged out and regularly teleported to random locations – still I saw enough on these first expeditions to get a sense of it. Here are a few screenshots I took on my travels to give you a feel for the space and the branded functionality. (all images are taken by me, the red shirted chap, in the environment may be copyright MTV or There.com – haven’t had time to read the small print, oh the copyright free’ish joys of Second Life). 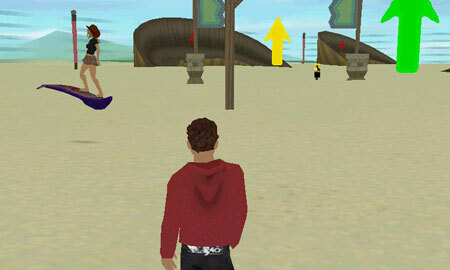 After a walk down a ‘orientation’, various how-to stages hill (very similar) to Second Life one arrives at the beach and several street off-shoots with similarly named stores to the series. The interface, not shown, allows you to teleport to a number of locations, around 10 as opposed to the thousands in second life – so wonder when the scale of this environment will mean people will loose interest? This is really aimed at 15-20 year olds, really simple learning curve and designed primarily to get chatting and grouping with others as quickly as possible, much like the Second Life teen grid and of course there.com, which this is built on. Obviously a big draw of the world is the social networking aspects for teenagers and there are a predominance of show-themed areas to sit, chat, flirt etc: In fact the interface has built in gestures that range from flirt, blush, side kiss etc: Very teenager. I wonder how many of the guest avatars actually do role-play like the show characters? I was told that the virtual space will have guest avatar appearances by the real show characters on occassion. What I would really like to see is scenes played out, almost theatrical, in sets from the TV programme and you can observe but potentially even get involved as extras – then even have the whole thing recorded as if it is a live shoot and output as typical machinima. But that may be too far ahead for the creators who are just getting the thing to stand up at the moment. Now this is where my real world Laguna Beach memory fades. 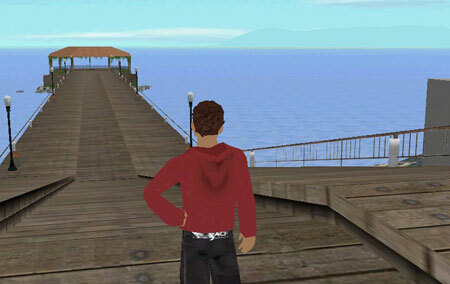 Does/did the pier really look like this? Of course it is no longer there, one of the benefits of a virtual ‘set’. OK now down to money. Scattered around the world are the LB ATM machines. Clicking on them tells you how to earn money. Not by making something or providing a service, no you earn your virtual credits by a) taking part in a typical web/ARG quest type game. $500 a day for getting all clues. Will go back and see how hard or easy this is. b) You also, like all good social networks, earn credits for doing social things – having fun, making friends and chatting and c) as mentioned before for watching advertising messages (an idea that is appearing all over the place). 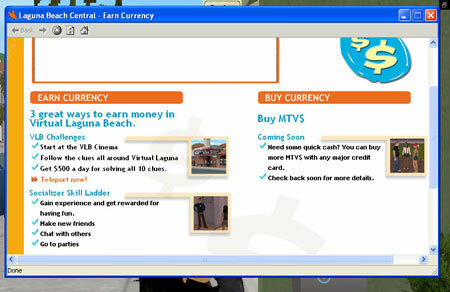 One key simularity with Second Life is that you can buy credits by converting your real money into VLB currency (MTVS) – that is the plan. There are a few things to buy, surfboards, clothes, tickets for events etc: There were also a few ‘closed’ houses on the hills and on the dead end sidestreets that did actually remind me of the real Laguna Beach and with premium membership you can own houses and cars – as well as exclusive access to celeb clubs. and one of the places one spends money, buying those identity defining clothes. On another tack I wonder if there will be a global narrative developed over time so people can role play. Each gender is only given a choice of 8 default characters which do not seem at first look to be the programme characters – which is just as well because on one street corner there were around 15 females all dressed and looking identical. Perhaps the service should be called Salt Lake City? No flames please. Some of the activities include the hoverboarding course. Now is that really in the show? and again endless teenage socialising. In its alpha stage a lot of the conversations come down to ‘what do we do here’, but I was surprised by the efficiency of creating and joining groups and the chat/IM elements compared with Second Life, which is a bit more down the ‘sysadmin’ tecchy road. Every 5 minutes I would be prompted to join a group by someone standing close – perhaps a range of MTV avatars are acting as social network catalysts. I think this is very significant – and excuse the slight forward train of thought. The engines that sit behind these ‘worlds’ are within reach of corporates now to set up and I suspect (just like blogs and wikis) in the wonderful world of web 2.0, VR world publishing will be in the hands of everyone within 2 years. An open source, easy to set-up on any webserver package will mean Second Life’s days are probably numbered – I think Croquet needs some major tweaking before it becomes a WordPress, but as I suggest in my Web 3.0 post there is an inevitability about corporates and the rest of us being able to host our own virtual spaces – and link them together the same ‘metaphorical’ way we link blogs and comments – so hundreds of thousands of personal virtual mini worlds running on a multitude of apache servers, with a virtual link between them – it appears as if they are next to each other in the virtual space. I have posted prolifically about MUVE’S (Multi User Virtual Environments) in the past, concentrating mainly on the ever customisable Second Life. 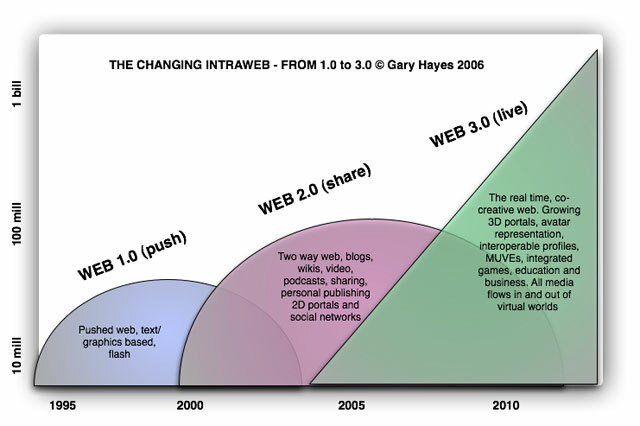 It is interesting to watch the buzz spreading and consider if virtual worlds are really web 3.0, I think so. 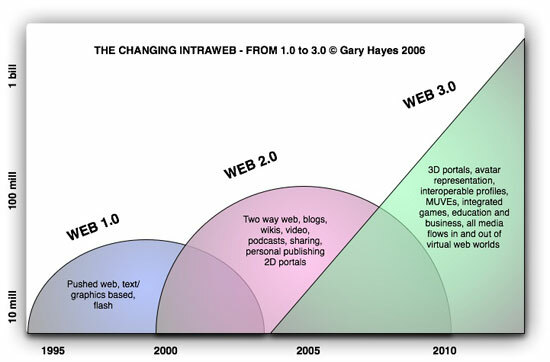 A quick look at the evolution of the intraweb from the mid 90’s. From text and graphics dominate 2D environments, immersive web sites with flash quickly followed combined with ubiquitous communication via IM and IRC chat. Then the early 00’s with the expontential growth of self publishing, blogs and wikis. From 2002 onwards the massive sharing social network communities of flickr and YouTube in sync with the explosion of portals containing all of the above in services such as MySpace, Yahoo and MSN etc: We are heading towards a rich media personal hub that points to and houses all of our ‘shareable’ content. But the current 2D web, mostly linear to linear linking, is about to be enhanced by virtual environments in which we meet as avatars, interact as 3D moving objects that takes sharing, co-creation and communication to the next, predictable level. The important component here is real time collaboration and communication as the paradigm shift. A sign that this is reaching a level of maturity is when big brands and subscriber numbers start to escalate. This item entitled Second Life Targets Existing Branded Web Communities succinctly sums up some of the major changes in one MUVE. Major companies such as Major League Baseball, and institutions such as The University of Southern California, have already turned to Second Life to host virtual events synched with live real-world events. 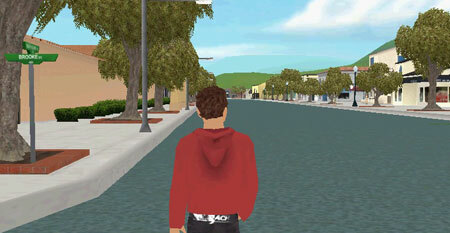 Organizations such as the New Media Consortium are using Second Life to convene meetings and conferences. 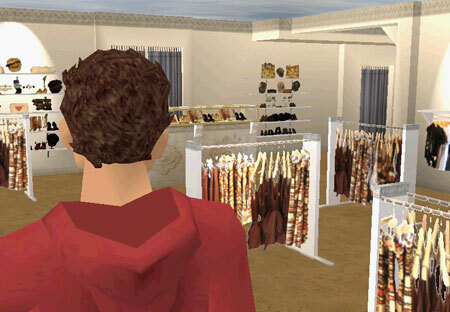 Wells Fargo is teaching kids about finance in an engaging manner through Second Life. Clothing designers are using the community to prototype their designs and get community feedback and build buzz before they have to manufacture.